When you hear "meatloaf," what comes to mind? Maybe an image of some gray-ish blob of questionable meat product slapped onto a plastic white plate by a lunch lady in a hairnet? I mean, it kind of gets a bad rap, right? 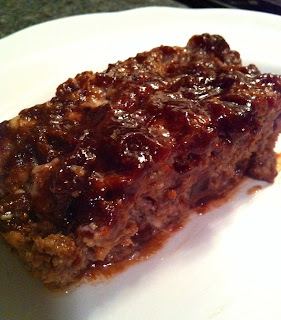 And maybe, in part, deservedly so -- because meatloaf can certainly be terrible. That may be why I thought that I didn't like it until just a couple of years ago. But in my newly-reformed humble opinion, meatloaf does NOT deserve this low regard... if done right. 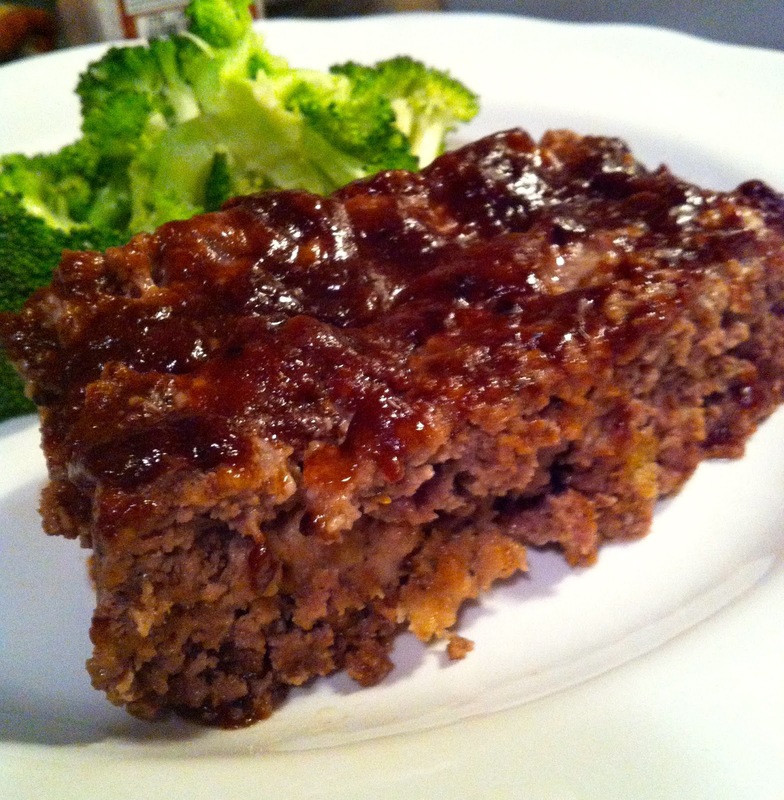 Meatloaf is made of delicious ingredients... it should be delicious! And it really can be. I've been refining this meatloaf recipe over the past year or so (with my boyfriend's taste-testing help), and it's finally perfect. I think the actual meat mixture is a pretty basic/classic combo, except that it's made a bit healthier by using wheat bread and lean beef. It's the spicy ketchup sauce (with 2 secret ingredients!) poured over top that brings it to another level. So. Good. I now make this meatloaf pretty regularly. 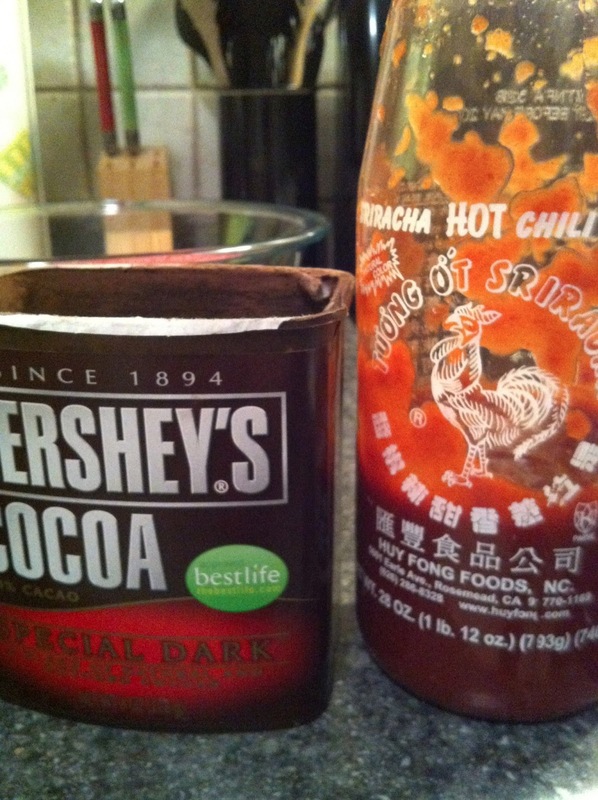 It's cheap, easy, and tasty -- always a good combo for a busy grad student. Mix everything together in 10 minutes, throw it in the oven, walk away and be productive for an hour, then sit down to a delicious meal. So... want to know how to make it? 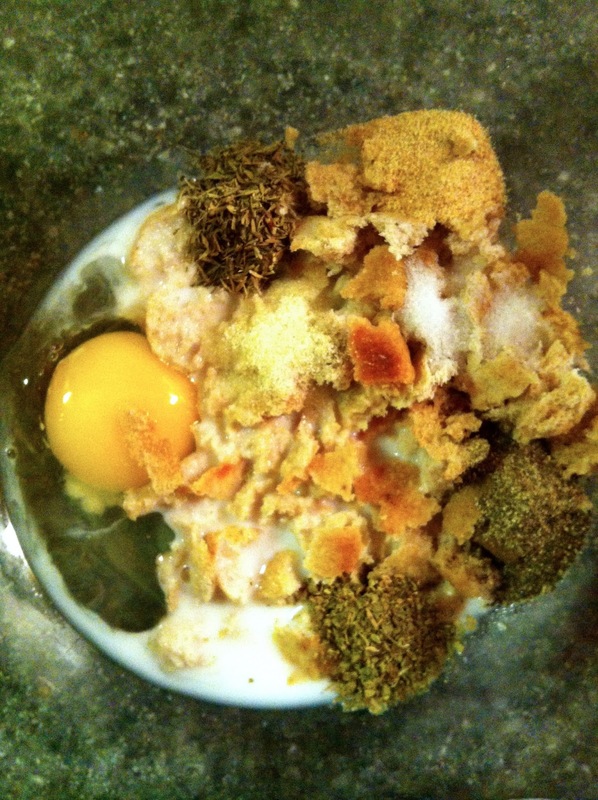 In a medium bowl, combine an egg, a splash of milk, some thyme, oregano, salt and pepper, and about 3/4 cup wheat bread crumbs. I typically use whatever wheat bread I have in my house and just tear it into small pieces. This time, I used 1/2 of a wheat pita pocket and about 1/4 piece of wheat naan. The pita works great because it's soft but dense enough to soak up the juices from the meat. Slightly stale wheat sandwich bread works well too. Other meatloaf recipes use stuffing mix, chunks of white bread or artisan bread, or even crushed chips. Any of these will work, they just won't be as healthy! 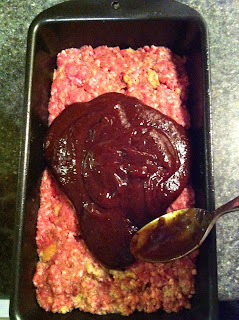 Also, if you want onion in your meatloaf, add 1/4-1/2 of a diced onion to this mixture as well. Unfortunately, the other person I cook for has a *thing* about chopped onions in cooked dishes. For example, according to him, the little onions that come on McDonald's burgers are THE WORST. So anyway, onions are great in meatloaf, but I left them out of mine. 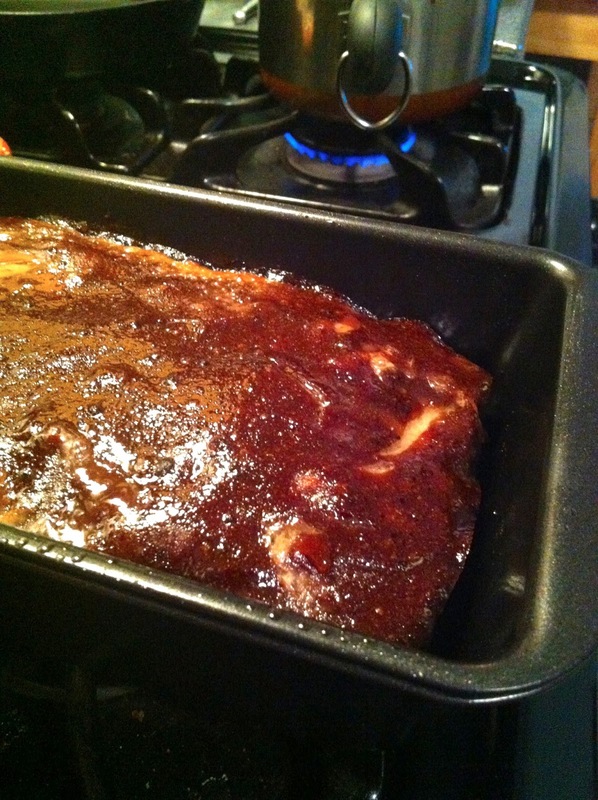 Then, prepare your spicy ketchup glaze. 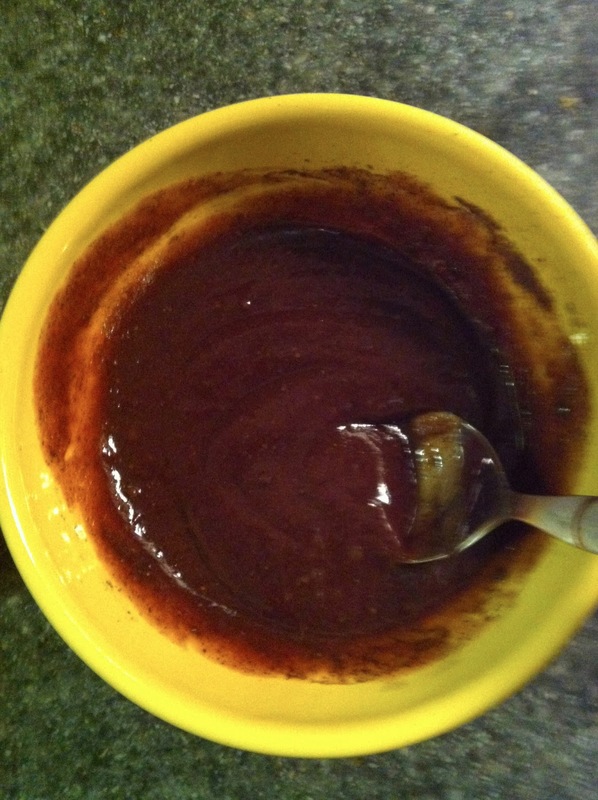 In a small bowl, mix about 3/4 cup of organic tomato ketchup with some A1 steak sauce, a pinch of dry mustard, a bit of brown sugar, and (*drumroll please...*) the 2 secret ingredients! 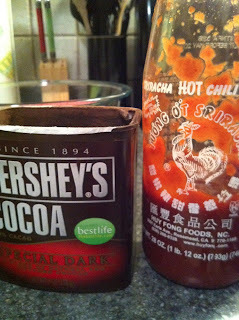 ...Sriracha (which I can't live without) and, yes, cocoa powder! 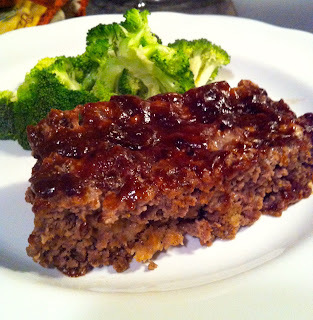 The sriracha makes this meatloaf nice and spicy, and the cocoa powder adds an awesome earthiness to the sauce. I got the idea for the cocoa powder addition from Alton Brown... his smoked meatloaf recipe sounds really good (but I don't have a smoker). Mix it all together. 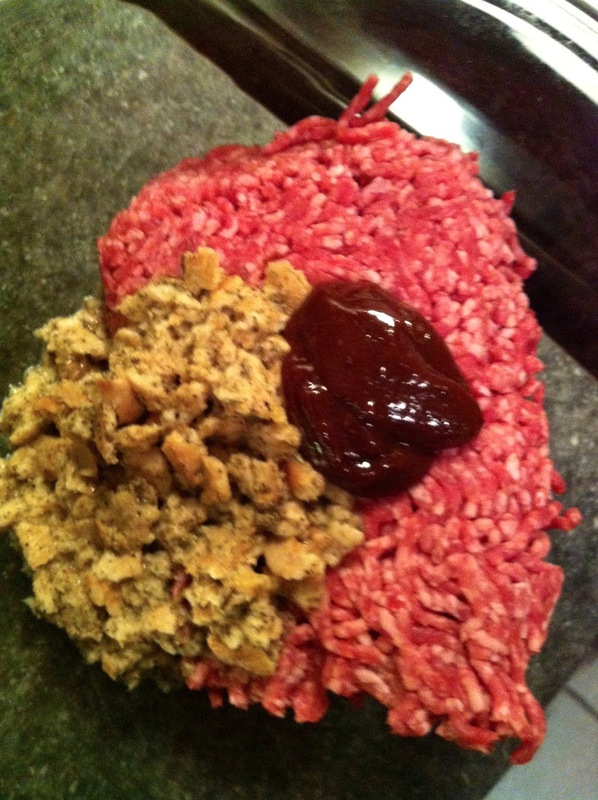 Put your ground beef in a large bowl. I often use 90% lean meat, but any ground beef will work (I've used both 80% and 95% if that's what's in the fridge). Pour the egg/bread mixture on top, along with about 2 tablespoons of the ketchup sauce. Mix gently until just combined. 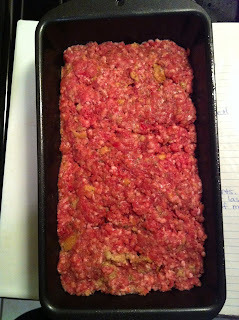 Then, shape into a meatloaf pan or banana bread pan. 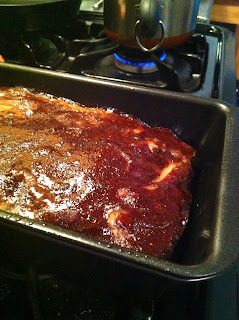 Since I make meatloaf relatively often, I bought a 2-piece draining meatloaf pan that allows the fat from the beef to soak out of the meatloaf into a bottom pan. I bought this one for super cheap off Amazon, and I think it's been totally worth it. But if you don't have a meatloaf pan (or a bread pan), you can shape the loaf yourself on tin foil on a baking sheet. I've heard of people putting pieces of bread under the meat to soak up the fat as well. 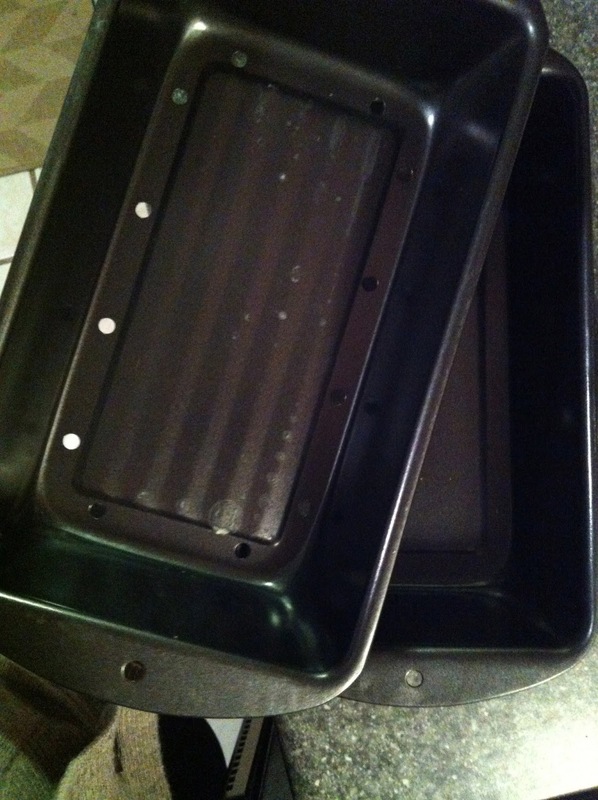 Look into the options... but I do recommend a meatloaf pan if you plan to make it more than a couple of times! Then, spread the rest of the ketchup sauce over the top of the meat. Then just pop it in the oven at 350 degrees for about an hour. It comes out so delicious. Seriously. Slice into pieces with a spatula and serve with some steamed broccoli or a salad for a delicious, healthy, and relatively low-carb dinner. Yum! -In a small-medium bowl, mix together egg, bread crumbs, milk, thyme, oregano, salt, pepper, and onion. -In a separate small bowl, mix together ketchup, brown sugar, dry mustard, steak sauce, sriracha, and cocoa powder. 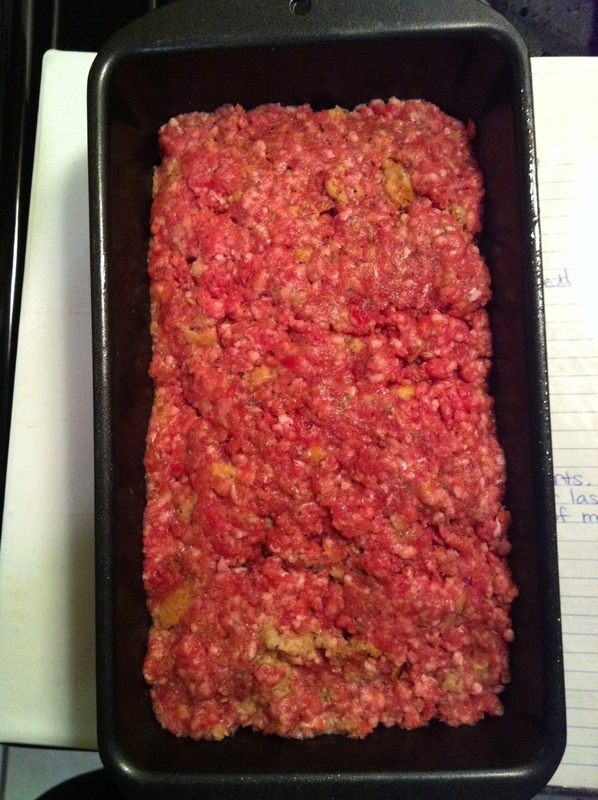 -Lay ground beef in a large bowl. 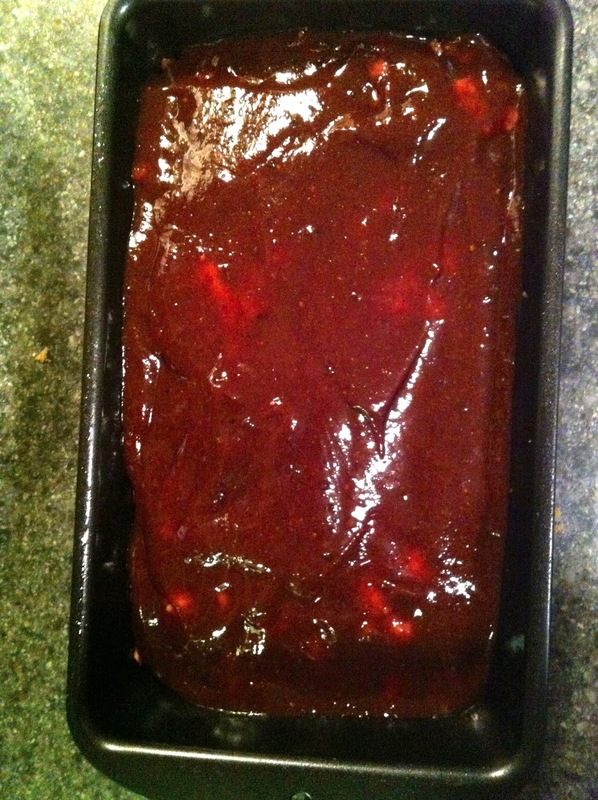 Pour egg/bread mixture over top, along with 2 tbsp of the ketchup mixture. Mix gently until just combined. Shape meat mixture into a meatloaf pan or banana bread pan. Top with remaining ketchup sauce. Taylor, thank you for linking this in to Food on Friday. We are now getting a great collection of meatloaves together. I hope you have stopped by some of the other links to check them out!